amudhanAr lauded emperumAnAr’s qualities, saying ‘guNam thigazh koNdal’; when asked “what is the nature the glory of his qualities?” amudhanAr divines about the nature of those qualities. “You praised his qualities saying ‘guNam thigazh koNdal’, what is the nature of the glory of his qualities?’ – to those who asked this, amudhanAr replies – I am a complete sinner, and am drowned in the sea of material life, and emperumAnAr without my knowing to ask for anything, by his high grace only came himself to me and corrected me such that I became his servant – after that – emperumAnAr towards whom parAnkusa, parakAla, nAtha, yAmunAr, and others are having special love, and is having the great thapas of SaraNAgathi after having given gadhya thrayam at the divine feet of periya perumAL for the upliftment of all the sentient, such emperumAnAr’s divine qualities cover all eight directions of the earth, and are completely bright and are seen everywhere in there. nal athisayam kaNdadhu – saw the great wonder. Or, for rAmAnusan than pugazh sudar mikku ezhundhadhu – even after taking me who is a sinner, as servant, his glory is not diminishing and not only that, it is flourishing and appeared with unsurpassed brightness. In that case, ezhundhu – appeared. kozhundhu vittu -> the karmas are present and flourishing . vemmai – terrible/cruel; kOL – midukku – strength. aru munivar thozhum thavaththOn – aru – ‘sa mahAthmA su dhurlabha:’ – said gIthAchAryan because he thought “Alas! nammAzhvAr incarnated only after the completion of my incarnation, and so could not get the dharSan of him during my time!”, periyavAchchAn piLLai divines the meaning for this phrase from SrI bhagavath gIthA, so ‘aru’ refers to nammAzhvAr who was hard for Him to get/see. munivar – As ‘vAsudhEvas sarvam’, and, ‘uNNum sORu, parugu neer, thinnum veRRilaiyum ellAm kaNNan emperumAn [thiruvAimozhi]’, these are the meanings he was thinking in meditation for sixteen years, which he revealed as dhivya prabandham. periyavAchchAn piLLai divined this meaning as well. In this way the completely rare to get nammAzhvAr, and those who got his grace, that is, nAthamunigaL and AlavandhAr, were worshiping the ‘bhavishyadhAchArya vigraham’, and were meditating upon his divine incarnation, and were living taking a lot of efforts, so amudhanAr is calling them together as “munivar”. jeeyar also divined this meaning about emperumAnAr in ‘kAlathrayEpi karaNAthrya nirmithAthi pApakriyasya SaraNam bhagavath kshamaiva – sAchathvayaiva kamalA ramaNErthithAya kshEmassa Evahi yathIndhra bhavchchrithAnAm’ [yathirAja vimSathi]. when recited as ‘irAmAnusan thol pugazh’ – it is about the eternal, natural, auspicious qualities. as said in ‘yath brahma kalpa niyuthAnubhavEbhyA nASyam’, those bad deeds could not be rectified by experiencing its effects or by doing amends – due to such strong bad karma, I am drowned in this material world and where I cannot find the shore, such world that is of endless sorrows and which is said as ‘maRRa narakam’, that is the opposite of the great happiness of the higher world (SrIvaikuNtam); vemmai – terrible/cruel; kOL – midukku – strength. aththAl nal athisayam kaNdadhu iru nilamE – Due to the uprising of his auspicious qualities after accepting me who am a complete sinner, as said in ‘vasundharA puNyavathee’, the earth felt relieved that its load (of bad) would reduce. It can be read together as – ‘sudar mikku ezhundhadhu – kozhundhu vittu Odip padarum – and the meaning can be said as – those uprising auspicious qualities after accepting me, got the disease/wanting of wishing to save more and more people like me if they are present in this world, and so grew more and more and spanned and covered the whole world in all directions. This is the nature of the glory of auspicious qualities of emperumAnAr – is the thought here. nirayaththu azhundhiyittEnai vandhAtkoNda pinnum – nirayam -> hell; here, it is this samsAram (material world/life). The sorrows given by servants of yama in hell is limited – once the sins are exhausted that sorrow would stop. But living in this material world due to our eternal karmas can be never ending sorrows. amudhanAr says he has drowned in such hell; even emperumAn is not able to lend his long arm to pull him out of it, it seems. Even in that state emperumAnAr came and pulled him out and accepted him. It is to be relished to see the beautiful way in which amudhanAr has portrayed the divine auspicious qualities of emperumAnAr – Since he came to the place of drowning, his vAthsalaym is seen; since he came without request, his svAmithvam is seen; by accepting him as servant, his Sauseelyam, and by his coming directly himself, his saulabhyam are seen; since he came knowing me who was drowned, his knowledge (gyAnam), and since he pulled me and saved me and kept as his servant, his completeness (pUrthi) of qualities are seen; saying ‘em irAmAnusan’, shows the connection/goal – and thus gives us enjoyment to see these qualities shown. There is similarity in how AzhvAr said that thiruvEkatamudaiyAn saved him and is standing there looking for more such people to save, in pAsuram – ‘sOdhiyAgi ella ulagum thozhum.. [thiruvAimozhi – 3.3.5]’. Also a similarity in where he says ‘neesanEn niRaivu onRum ilEn, en kaN pAsam vaiththa param sudar sOdhikkE [thiruvAimozhi – 3.3.4]’. 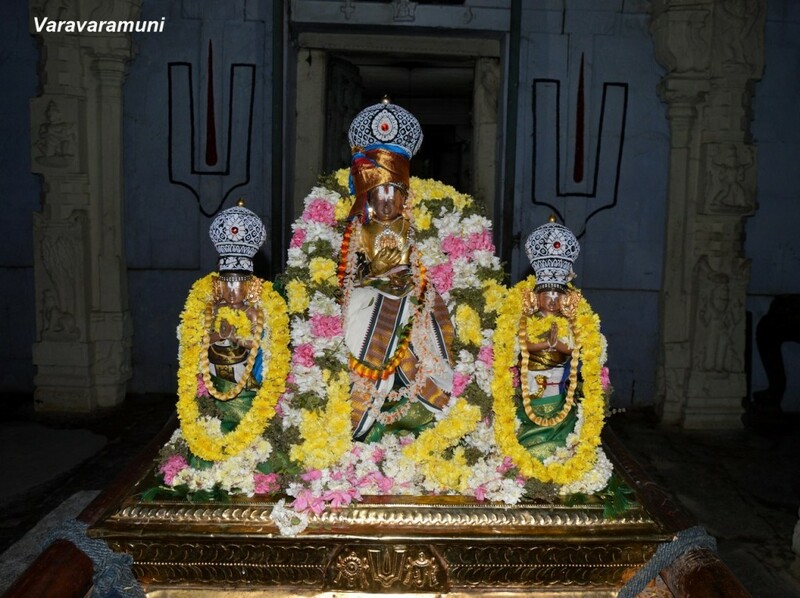 This entry was posted in iyaRpA, rAmAnusa nURRanthAdhi and tagged amudhanar, emperumanar, nurrandhadhi, nurranthadhi, nutrandhadhi, nutranthadhi, ramanujar, ramanusa on December 10, 2016 by raghuram.